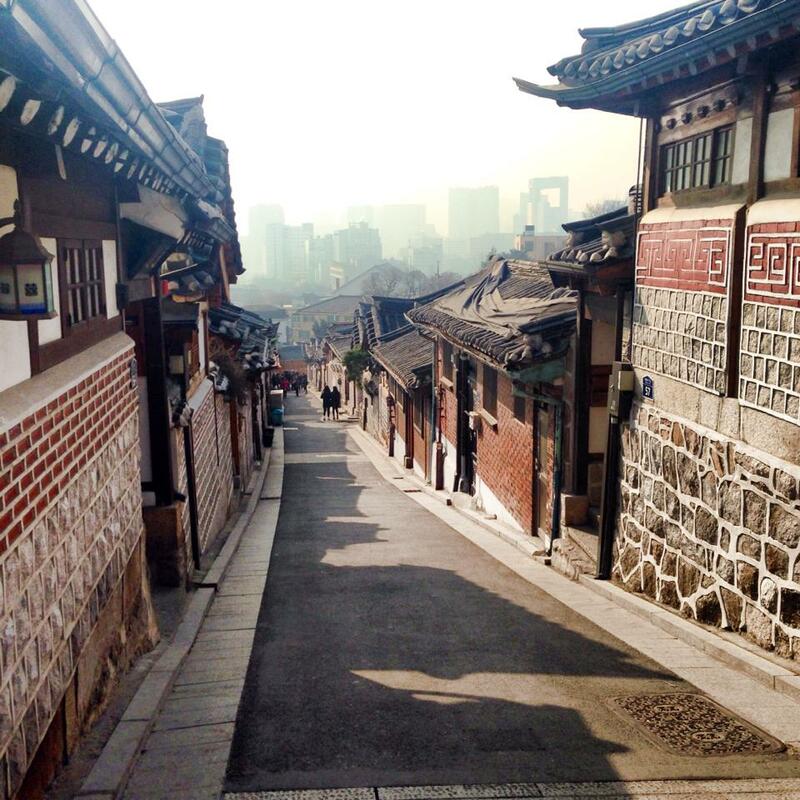 As a huge fan of Korean dramas, Seoul has always been one of my favourite cities. It will be cool if I can ice skate at Namsam park like what was shown in Boys over Flowers, sit at the doorsteps of the old house in Personal Taste just like the lead actor and actress, stroll in Gyeongbogung to see the famous lake where the crown princess drowned in Rooftop Prince, etc. Indeed, with the popularity of the Korean dramas worldwide, many fans like me have embarked on some form of “pilgrimage” to Korea. I made my first trip to kimchi-land 4 years ago back in spring of 2010 and was extremely excited when I had the opportunity to be back again in Seoul 4 years later, this time during winter. There are tons of stuff to see, do, shop and eat in Seoul and so I am going to share some recommendations on the top things to do to maximise your limited time in Seoul (I realized that I was always racing against time in this city). Just opposite the Gyeonbokgung main gate is the Gyeonghwamum square which has the statutes of King Sejong the Great and Admiral Yi Sun-shin. A walk further down Cheonggye Plaza which is where Cheonggyecheon (aka the Cheonggye steam) starts. I would suggest visiting this area after seeing Gyeongbokgung and you could spend your evening strolling along the Cheonggyecheon. 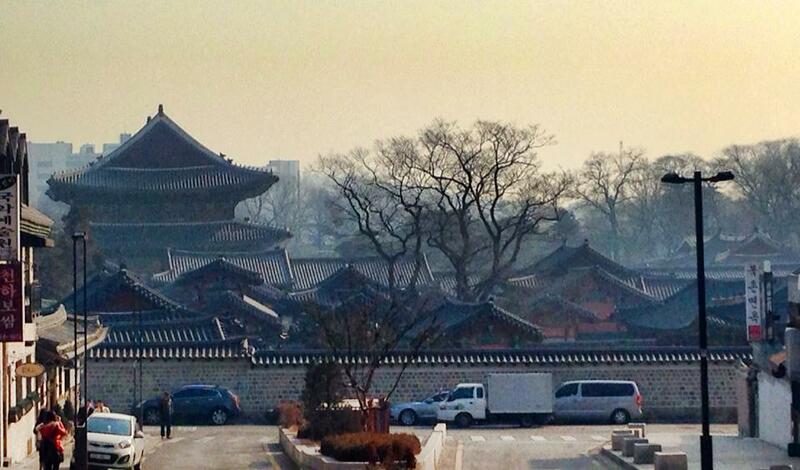 Also known as the Eastern Palace, Changdeokgung is just a subway stop away from Gyeongbokgung. This palace is an UNESCO world culture heritage site, famous for its perfect harmony between nature and artificiality. 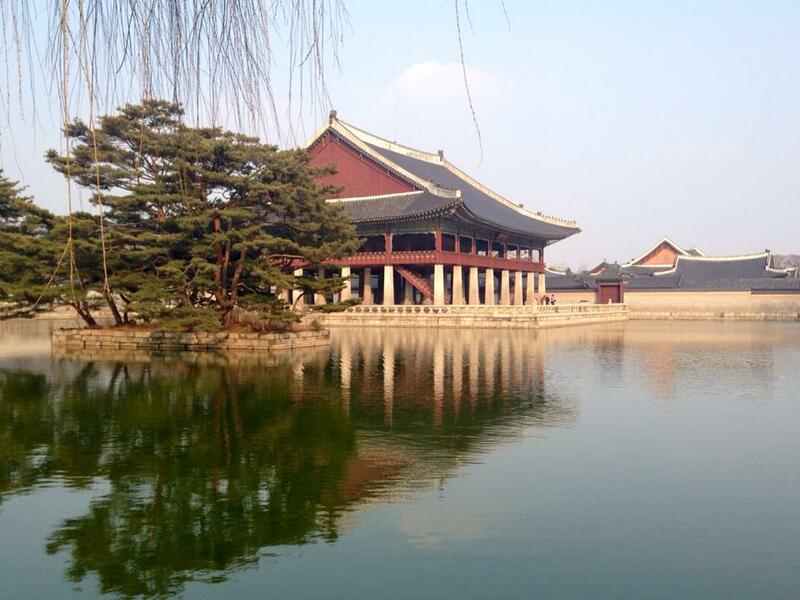 There are numerous online discussions on whether to visit Gyeongbokgung or Changdeokgung. If you have the time, it will be great to visit both. However, make sure that you add on the Secret Garden tour (you are not allowed inside unless you join the tour) when you visit Changdeokgung. If you only have limited time, I would suggest Gyeongbokgung for most of the year unless you are there during autumn where Changdeokgung ‘s secret garden would be beautiful. 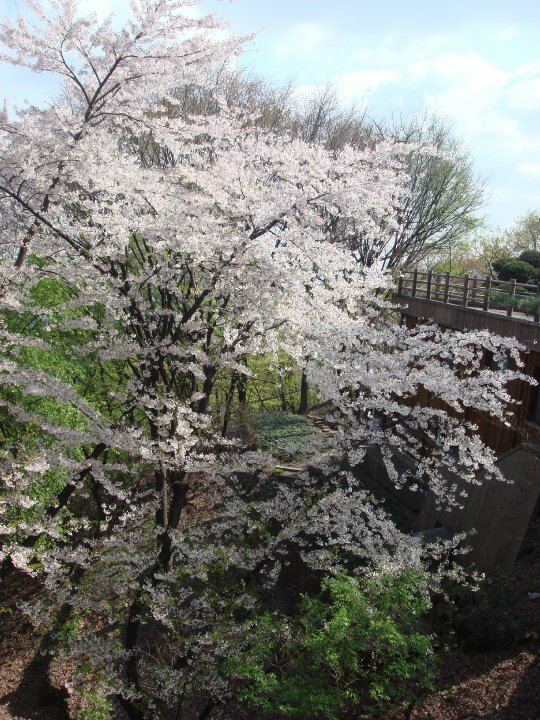 There are also 8 scenic sights in this area where you can get nice photos such as the view of Changdeokgung, the upward alley, the downward alley, etc. I really love this area and would highly recommend a visit even though you may decide to give Changdeokgung a miss. As this area is also a residential areas and the numberings of the houses may not be in sequence, I would suggest that you go to the information counter to get a map and ask specifically for directions of how to get to each sights including the Personal Taste old house. After taking in so much traditional sights, I find that the perfect way to come “back to the future” is to take a short walk to Insa-dong which has nice shops, eateries and galleries. Subway: Anguk. This is a big area so I think the easiest route is to start with Bukchon Hanok Village (unless you know the area and do not need to take the map from the information counter else you may have to walk back-and-forth). Take Exit 2 and just follow the road into the Hanok village and you will be able to find the information counter for the Bukchon Hanok Village. You can then see the scenic sights 4 to 8, followed by 3, 2 and 1. After seeing scenic sight 1 (which is the paranomic view of Changbokgung), you can just follow the road along the palace towards the main street and you will reach the ticket counter for the palace. Do take note of Secret Garden tour timing (think the English tours are at 11.30am, 1.30pm and 3.30pm) and it takes around 90 minutes for the tour. Insa-dong is at Exit 6. By the way, during spring, you will get beautiful cherry blossom blooiming so make sure you go during the day to see. You can also catch nice view of Seoul from the park as it is up the hill. In winter, there is an ice-skating rink just outside Grand Hyatt hotel at Namsam Park and is a popular “dating activity” for the evening/night so you may want to try it. This is also where the lead actor and actress in Boys Over Flowers went on a double date. Subway: Hoehyeon (exit 1). 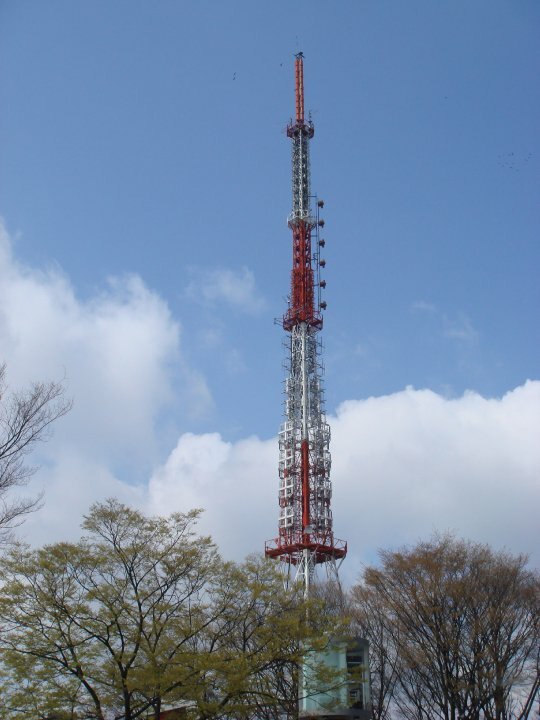 I suggest catching a taxi up to Namsam cable car station and you can then take the cable car up to Seoul Tower. Ok, you must have by now seen or heard the “Gangnam style” so how can you not go to Gangnam area? To be frank, there is nothing much except shops, business offices and the U street with many media poles but somehow after all the craze of Gangnam style, you just have to go here. I am not sure if you have watched the Korean drama Cheongdam-dong Alice. After watching that, I just tell myself I have to see this “atas” (Singlish way of saying posh) district. This is where all you can find Galleria, posh salons and all the luxury brands and designer shops. Unless you have an extremely deep pocket (which I obviously don’t), treat this as “sightseeing” rather than shopping. The theme park has separate outdoor and indoor sections, offering rides for both young children as well those seeking a little excitement. I love the Lotte World Hotel which is conveniently located beside the Lotte World theme park and would recommend that you stay one night here so that you can visit the outdoor theme park during the day and the indoor one when the sun sets. 1) Getting to/from airport and city centre: The easiest way of course is by taxi which costs around KRW 55,000 to 60,000 including tolls for normal taxi. Note that there are 2 types of taxi, the normal ones (in yellow) and premium ones (in black). Premium cabs will cost around KRW 75,000 for the same trip. If you are travelling on a budget, the cheapest way is to take the Airport Railroad Express (AREX) and transfer to the subway. Journey time is around 1.5 hours but it costs around KRW 4,000. Alternative, the airport limousine bus is the faster and not too expensive option to get into Seoul city (KRW 15,000, travelling time around 40 minutes).You can refer to https://www.airport.kr/iiacms/pageWork.iia?_scode=C1203050000 for more details. 2) The subway in Seoul provides an effective and efficient mode of transport around the city. The ticket vending machine has English instructions so it should be easy. Single trip ticket costs KRW 1,650 including KRW 500 deposit which you can get back after your trip by inserting the card into the refund machine. You may be intimidated by the complex train system initially but don’t worry, the Seoul train system is not that complex. As a usual rule of thumb, first take note of the station that you are at and the station that you want to get to. Then map out which train route(s) numbers you need to take including the direction of travel. 3) Taxis in Seoul is also pretty reasonably price (or could be cheap compared to the European countries, US, Australia and even neighbouring Japan). So if you have 3 or more people, it may be worthwhile just to take the taxi versus the subway. 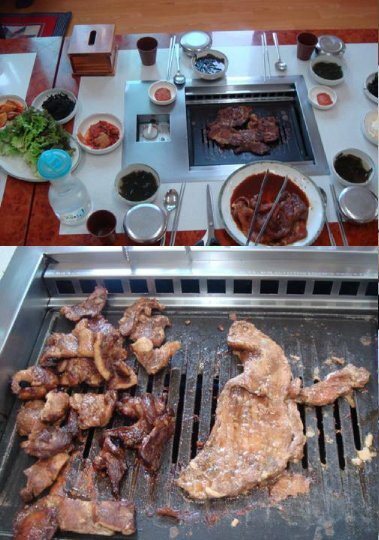 – Pricing of food in Seoul is pretty reasonable. You should be able to get a decent Korean meal in a normal restaurant between US$10 to US$20 depending on what you order. 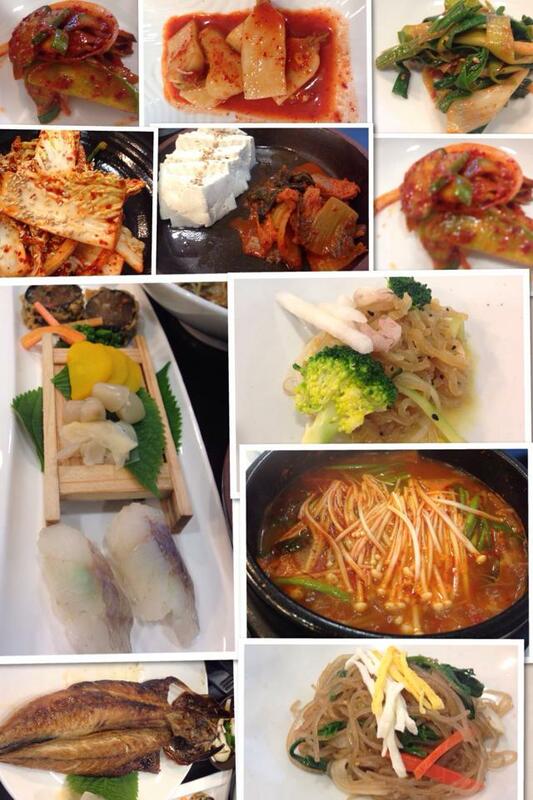 Korean restaurants also serve Korean small dishes such as kimchi, glass noodles, etc for free when you order a main course and these small dishes are usually refillable. – I believe most of you would be quite familar with Korean food and what to order. But for those who need a little help, I have put up some photos of my few favourite dishes. Unlike some other of my blogs, I am not putting names of restaurants here as most of the time I just pop into any one based on the type of food/craving that I was having and typically they are good (you can’t really go very wrong with Korean food if you like BBQ, Kimchi and soupy stuff). 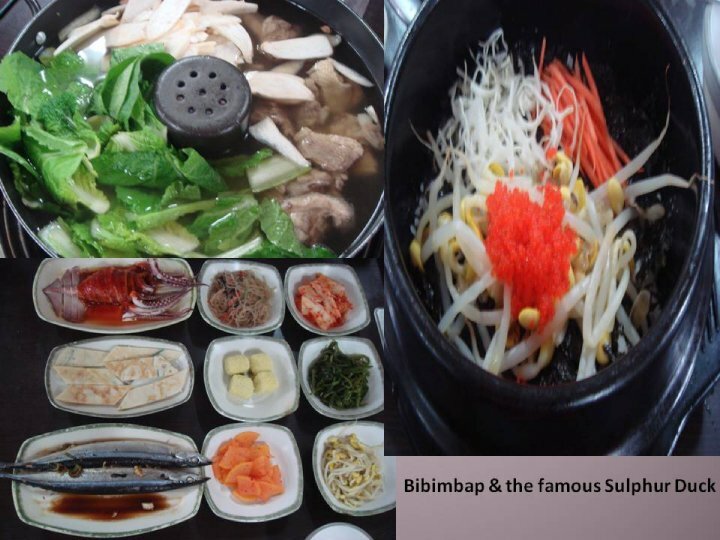 Must try food include the famous Korean BBQ and the Korean Gingseng Chicken Soup (we heard so much about it and so how can we not eat them)? 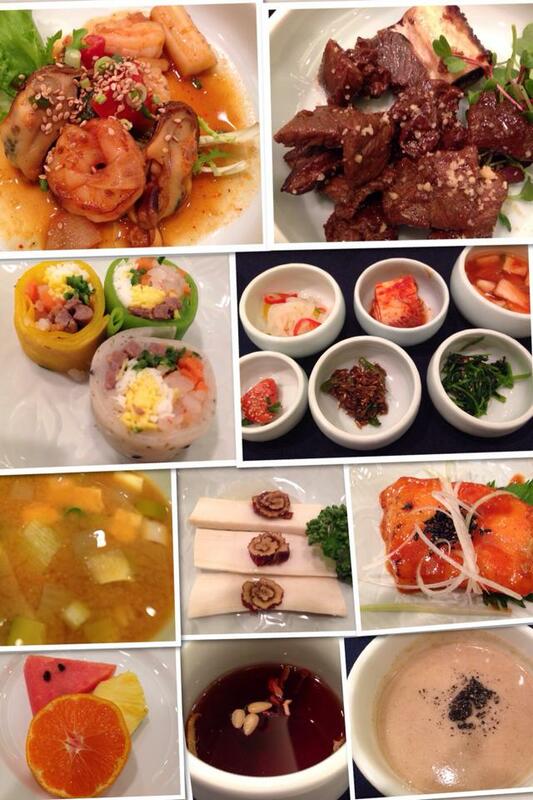 – There are more “formal” Korean lunch/dinner that are still pretty affordable (between US$20 to US$50) where you get a main course with more variety of side dishes and dessert. Of course, similar to any other cities, the further you are away from the tourist spots, the less likely you will fall into any tourist traps and get better and cheaper food. 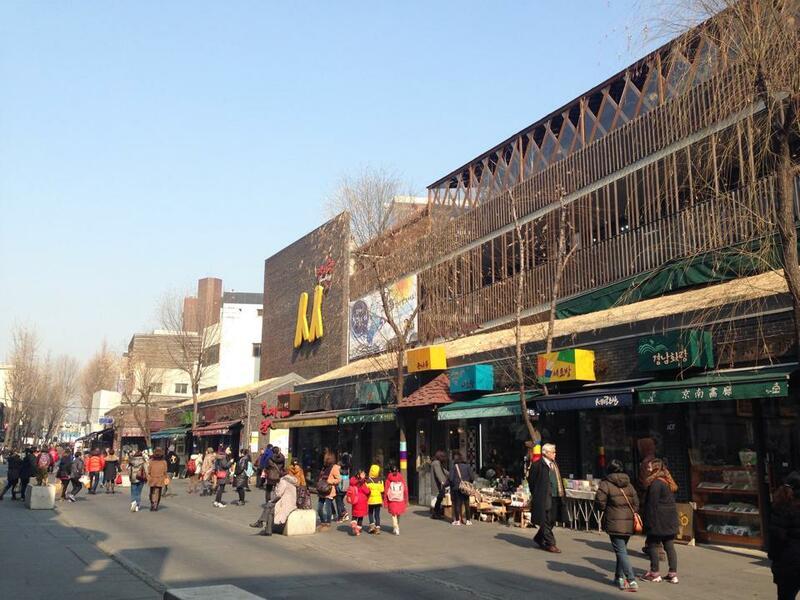 1) Dongdaemum area: This is THE PLACE that you should go if you want to look for trendy clothes and shoes. There are various wholesale markets here so you would be able to get better deals versus the normal retail shops around the city (which would have gotten their stocks from here). I particularly love Nuzzon and Migliore. Take subway to Dongdaemum to see the nice Dongdaemum gate. This is a short walk to Migliore. 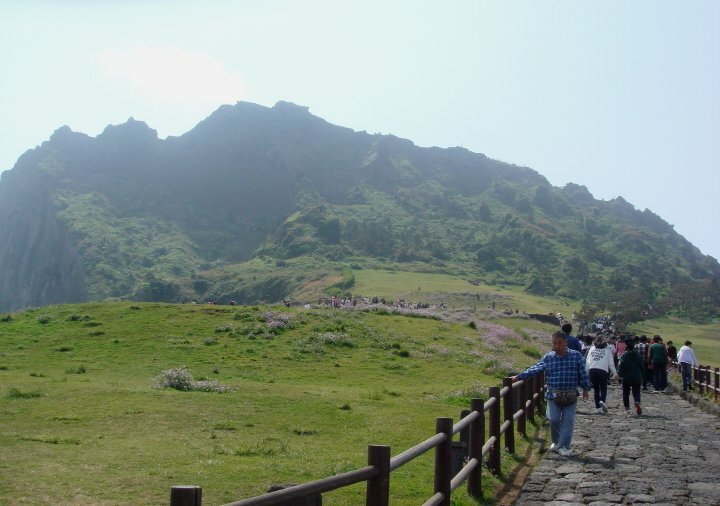 Alternatively take to Dongdaemum History & Culture Park station which is nearer to the shopping. 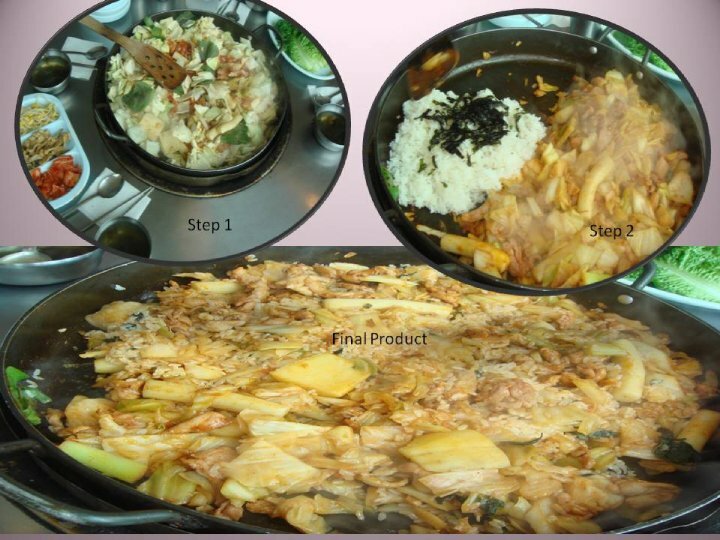 2) Namdaemum area: If you are looking for much cheaper stuff versus Dongdaemum, Namdaemum market is a good place to go. However, I do find that Dongdaemum’s stuff is trendier although slightly more expensive. Take subway to Hoehyeon. 3) Other nice shopping areas include Myeong-don (subway: Myeong-don), Sinchon and Ewha university area (subway: Sinchon or Ewha), Itaewon (subway: Itaewon). 4) You may have heard from friends and colleagues who have been to Korea that they bought tons of cosmetics. Indeed, with majority of the Koreans being so obsessed with looks (it is common for Koreans to undergo some form of cosmetics surgery), you can trust Koreans to come up with good facial and makeup products. Popular brands include Face Shop, Étude House and Innisfree and it’s also much cheaper to buy them in Korea versus overseas. 1) If you are taking Singapore Airlines and have lounge access, there is a relaxing 15 minutes free facial massage in the lounge. No pre-appointment is needed and at the end of the facial, you will also be given a trial pack of facial products. 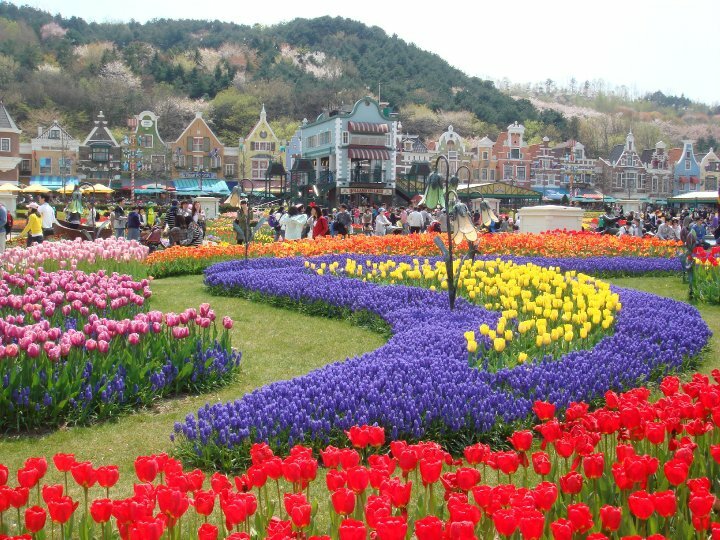 If you love theme parks and Lotte World is insufficient to satisfy your adrenaline rush, head over to Everland which I would say is one of my favourite theme park. I love the beautiful garden which the theme will change every season (the one that I saw in April was beautiful tulip gardens with “Europe theme”). 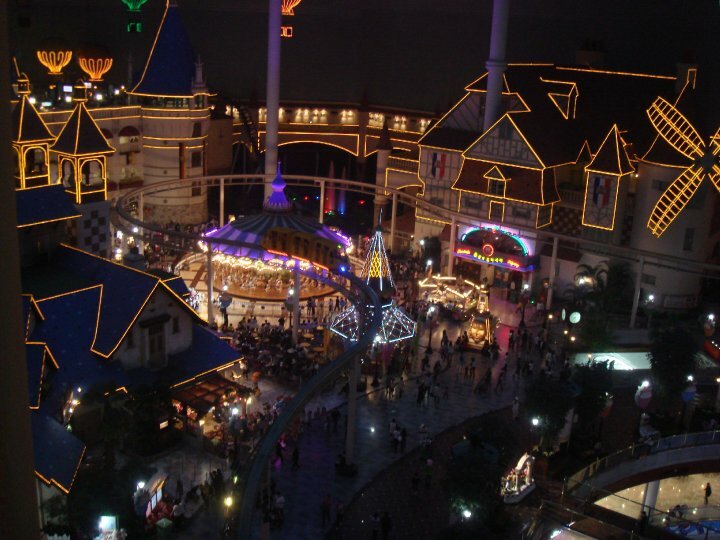 The theme park is not too far out from Seoul and can be easily accessible via public transport. You can refer to https://www.everland.com/web/multi/english/everland/everland_guide/transportation/Transportation01.html for more details.